Easy Chicken and Sausage Jambalaya is the ultimate Mardi Gras food, and a staple found all along the Gulf Coast, especially in New Orleans. You won’t believe how easy it is to prepare and it’s perfect for a quick weeknight meal with your family. Easy Chicken and Sausage Jambalaya is also a great make-ahead dish to serve guests. If you are wondering when Mardi Gras is, or what dates it begins and ends, technically Mardi (French for Tuesday) Gras (French for Fat) refers to Shrove or Fat Tuesday which is the day before Ash Wednesday. In reality, Mardi Gras refers to the Carnival celebrations, which begin on January 6 (the Epiphany) and end on Fat Tuesday. Because it is tied to Ash Wednesday, which is aligned with Easter, the date changes every year. For 2019, Fat or Shrove Tuesday is on March 5. What are the Mardi Gras Colors? The colors of Mardi Gras are purple, green and gold (yellow), supposedly because of a visit to New Orleans in the late 1800s by Russian Grand Duke Romanoff whose family colors were purple, green and gold. Purple is said to represent justice, green to represent faith, and gold to represent power. Where is Mardi Gras Celebrated? Because the celebration is tied to religious dates, Mardi Gras is celebrated all over the world, but most notably in New Orleans. Biloxi, Mississippi, Mobile, Alabama, and Pensacola, Florida, cities east of New Orleans also actively celebrate Mardi Gras with krewes, numerous parades, and balls. Need more ideas? Check out these posts: Ten Classic Mardi Gras Recipes and The Ultimate Mardi Gras Recipe Collection by my sister Chula, over at the Pudge Factor Blog. 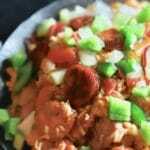 What’s the Origin of Jambalaya? Jambalaya was first prepared by early Spanish settlers who were trying to make paella with ingredients, which were available in Southern Louisiana. What’s the Difference in Jambalaya, Gumbo, and Étouffée? 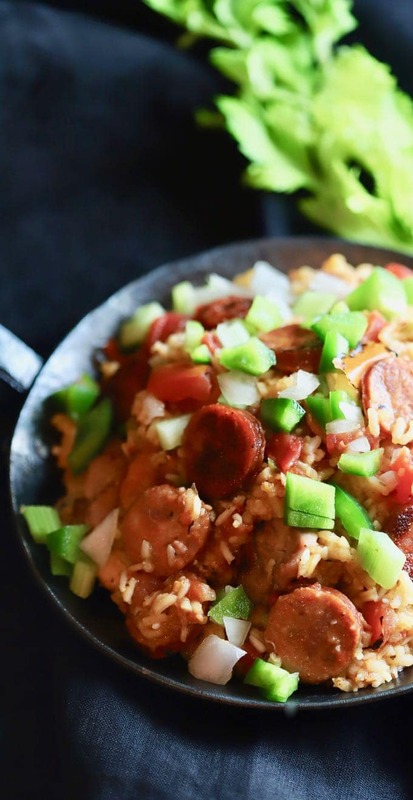 Jambalaya is similar to Gumbo and Étouffée but doesn’t have filé or okra like gumbo, and unlike Étouffée it does include Andouille or smoked sausage. The other main difference is that Jambalaya is cooked with rice and Gumbo and Étouffée are both served over rice, which is prepared separately. 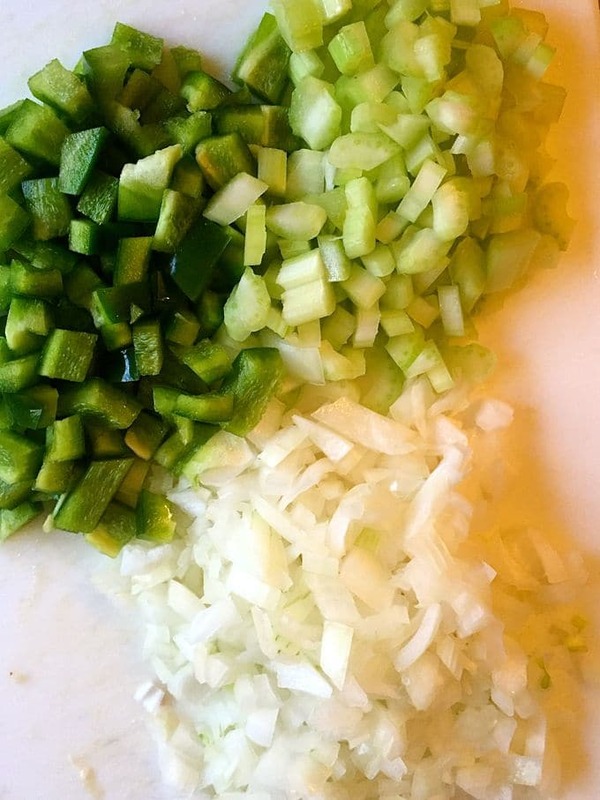 The “holy trinity” seen in Cajun or Creole cooking is celery, bell pepper, and onion. 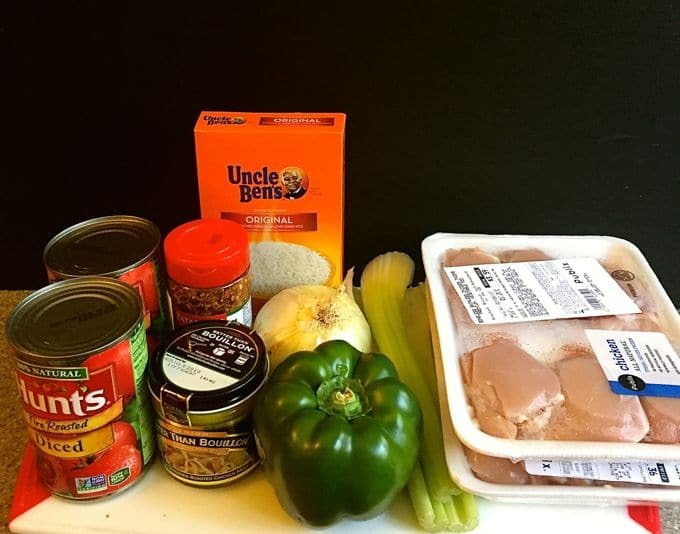 The ingredients for Chicken and Sausage Jambalaya are olive oil, boneless, skinless chicken thighs, Andouille sausage, onion, celery, bell pepper, garlic, Creole seasoning, dried thyme, dried tarragon, uncooked long-grain rice, chicken broth, and diced fire-roasted tomatoes. Gather the ingredients and heat olive oil in a large Dutch oven over medium-high heat. When the pan is hot, add the chicken and sausage and cook until browned on all sides, which will take about 10 minutes. Be sure to stir frequently to prevent the meat from sticking. When the meat is done, remove from the pan with a slotted spoon and drain on paper towels. Set aside. 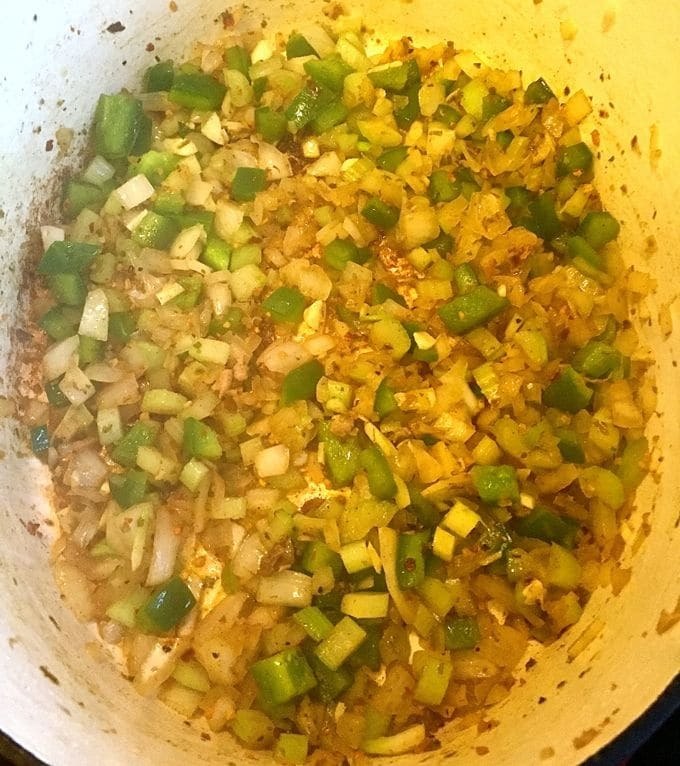 Add onion, bell pepper, and celery to the pan drippings and cook for about 5 minutes. Add the garlic, Creole seasoning, thyme, and tarragon and continue cooking for another 5 minutes. Stir frequently. Add the uncooked rice and stir until well combined. Cook for 3 minutes. Add the chicken and sausage back in and then add the chicken broth and tomatoes. Stir well to combine and bring to a boil. Stir again, cover and reduce the heat to medium-low. Cook covered for about 20 minutes, stirring occasionally. This recipe as written is spicy! If you prefer less spicy food, decrease the amount of creole seasoning. If you would like to include shrimp in your Jambalaya, about 5 minutes before the Jambalaya is done, add a dozen uncooked, peeled and deveined large or extra-large shrimp to the Jambalaya mixture and combine. Leftovers, if you have them are also delicious the next day! Please rate it and let me know what you think in the comments section. Also, take a picture, post it on Instagram, tag @gritsandpinecones, and hashtag it #gritsandpinecones. I love hearing from you and seeing what you have made! To get the latest recipes by email right in your inbox enter your email address here! Also, follow me on Pinterest, Facebook, and Instagram. *This recipe originally published January 27, 2017. Republished January 17, 2019, with expanded directions and information about Jambalaya and Mardi Gras. 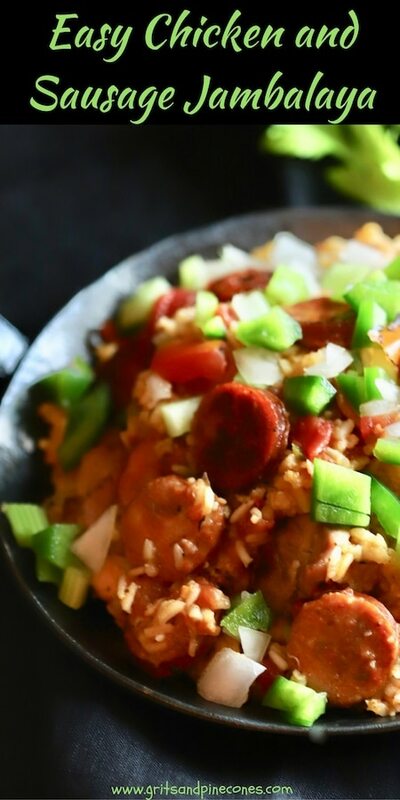 Easy Chicken and Sausage Jambalaya is the ultimate Mardi Gras food, and a delicious entrée found all along the gulf coast but especially in Southern Louisiana. 1-1/2 lbs boneless skinless chicken thighs (about 6) cut into 1-inch pieces. Heat olive oil in a large Dutch oven over medium-high heat. When the pan is hot, add the chicken and sausage and cook until browned on all sides, which will take about 10 minutes. Be sure to stir frequently to prevent the meat from sticking. When the meat is done, remove from the pan with a slotted spoon and drain on paper towels. Set aside. Add onion, bell pepper, and celery to the pan drippings and cook for about 5 minutes. Add the garlic, Creole seasoning, thyme and tarragon and continue cooking for another 5 minutes. Stir frequently. I’d like to make this recipe at night and then put it in a crock pot for the next day at a work Mardi Gras Party. Any suggestions so that I don’t over cook any of the ingredients in the dish. Thank you. Hi Annette, although I’ve never used a crockpot, this jambalaya is delicious the next day reheated so I think it would work just fine. I think if it was me, I would keep it refrigerated at work and then about an hour before you plan to serve it, put it in the crockpot to reheat. 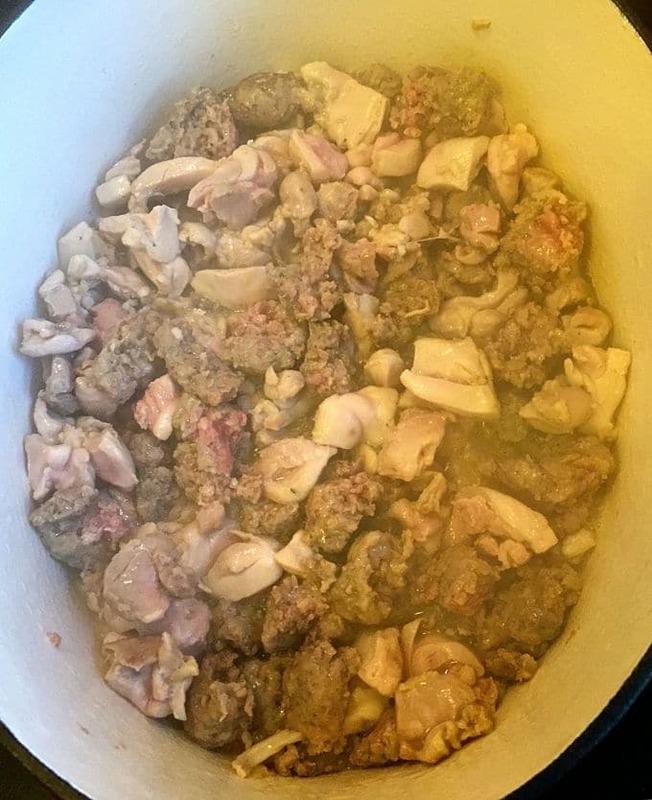 I would definitely spray the inside of the crockpot with non-stick cooking spray first, and you might also want to bring about a cup of chicken stock with you just in case to add if the jambalaya starts looking dry. I would only add about a tablespoon at a time because you don’t want it soupy. Hope this helps and good luck!